I am using a full size half-wave 30m dipole installed in my attic, a wire 14.2m long. I made it from 7.1m loudspeaker (figure-8) cable, split into two conductors. 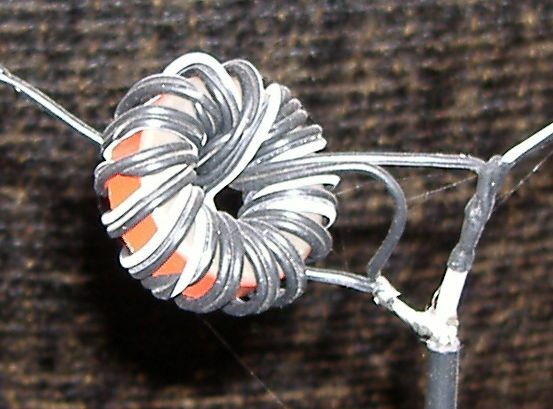 At the centre is a 4-1 balun constructed on a T130-2 toroid, according to the instructions at http://www.rason.org/Projects/balun/balun.htm. I connect the balun directly to my transmitter low-pass filter output (no ATU) using 5m of coax. 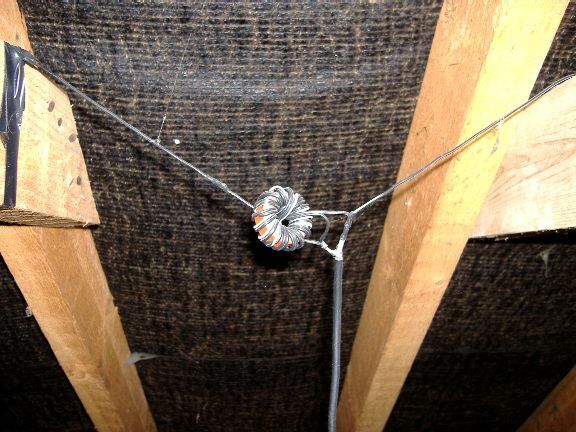 The wire is reasonably straight and is taped to the roof wood at intervals. 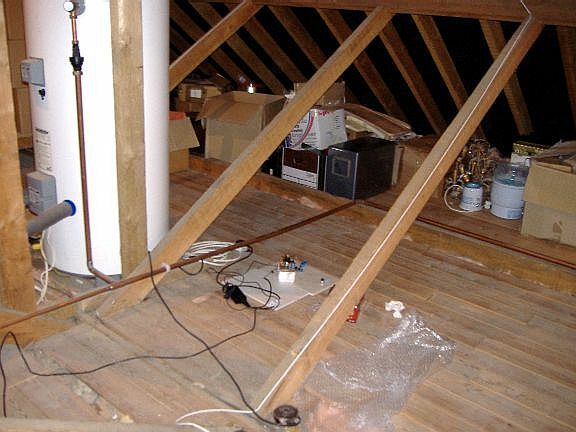 There are many pipes and cables running parallel to the wire on the attic floor, and even along the roof less than 1m from the dipole. I estimate that the height of the antenna is something like 6.5m (21 feet) above ground level. The junk box beacon lies unceremoniously on two bathroom tiles, with the old IBM laptop PSU (16V output). Mains power is from a socket (top left of picture) which I connected into a live wire I found in the lighting circuit (ssshhh, don't tell anyone). The bathroom tiles were leftovers from my house renovation project. I use the tiles because it gives me some (probably misguided) peace of mind that if all should go drastically wrong and the beacon overheat itself, then the wooden boards in the attic are less likely to catch fire. When taking this picture I crouched under the wire about halfway along one of the dipole's arms. You can see the coax hanging from the balun at the top of the picture, and trailing down to the beacon transmitter at the bottom right. The wire is reasonably straight. It is taped to the roof, about 4 feet (1.3m) above the attic floor. Many pipes and wires run parallel to the wire, along the floor and even along the horizontal beam quite close to the wire. Between fixing points, the wire droops a little under gravity and to fit the roof layout. The last few inches at the ends just hang down. 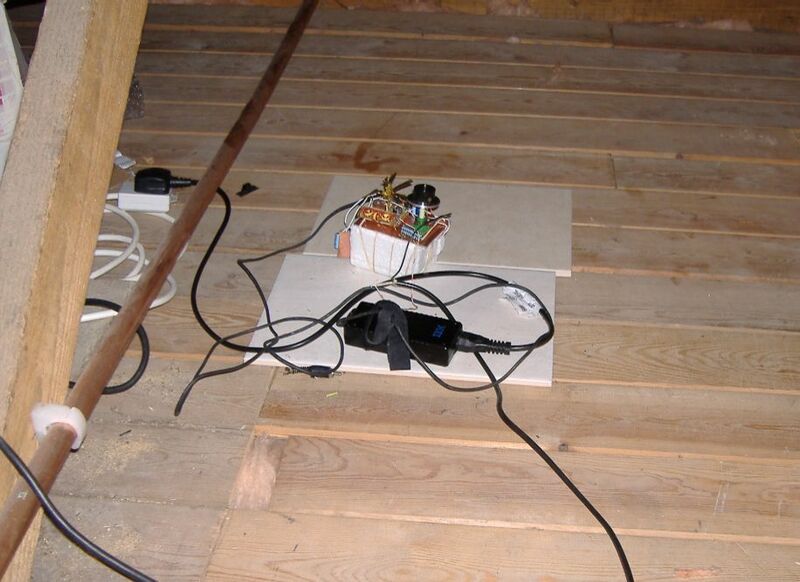 The transmitter location on the wooden boards in the attic. 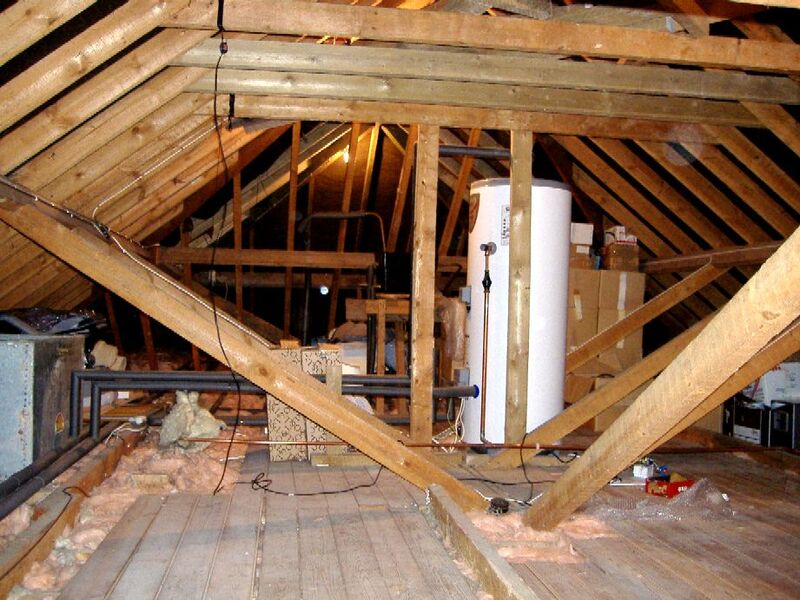 The attic is also used for storage of many household items, and even more of my electronics junk. Notice the old bakelite connection box right at the bottom of this picture, with a wire trailing from it? This is where I found 240V mains in the lighting circuits, and made my connection to a mains socket. The wire coming towards the bottom left corner of the picture is the coax to the antenna balun. Here's the balun at the centre of the dipole. Notice how it just hangs there in the middle of the antenna with its own weight pulling it down a little. Some more detail on the balun. It's wound according to http://www.rason.org/Projects/balun/balun.htm with 18 turns. I used the same loudspeaker (figure-8) cable as for the dipole, but without splitting the two conductors apart. This is from Google maps. I've drawn the location of the dipole in red. Assuming that google maps has North pointing vertically upwards on its maps and images, this means that the axis of my antenna points at 70 degrees to North. That is, the wire runs on a line that's pretty close to East-West - or more accurately, West-South-West to East-North-East. This is from Summer 2002 just before I moved here - so it's pre-renovation. 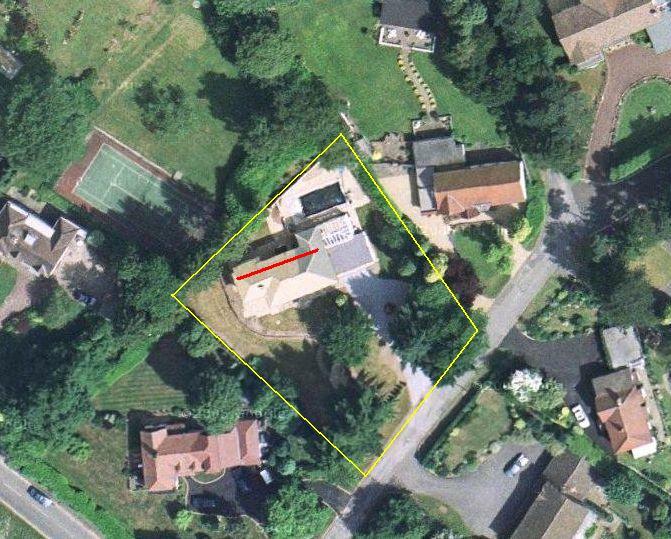 The place has changed quite a bit since then ;-) The dipole location is drawn as a yellow line. It is NOT along the highest point of the roof, it's half way up on the far side of the roof and only looks as though it runs along the top due to the angle of the photo. 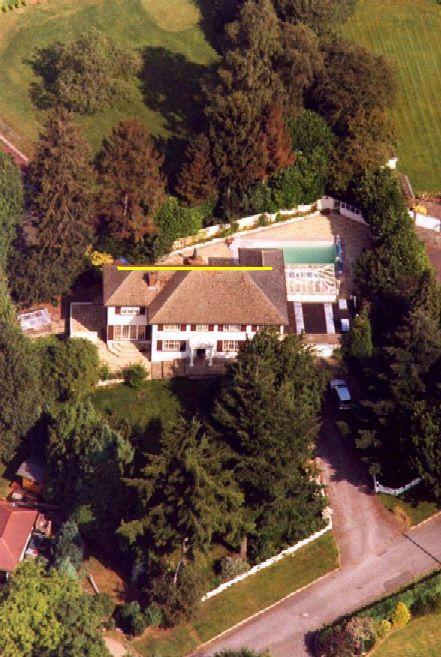 If ONLY I could put a 30m dipole between the tops of the tall pine trees in the front garden... can you IMAGINE!